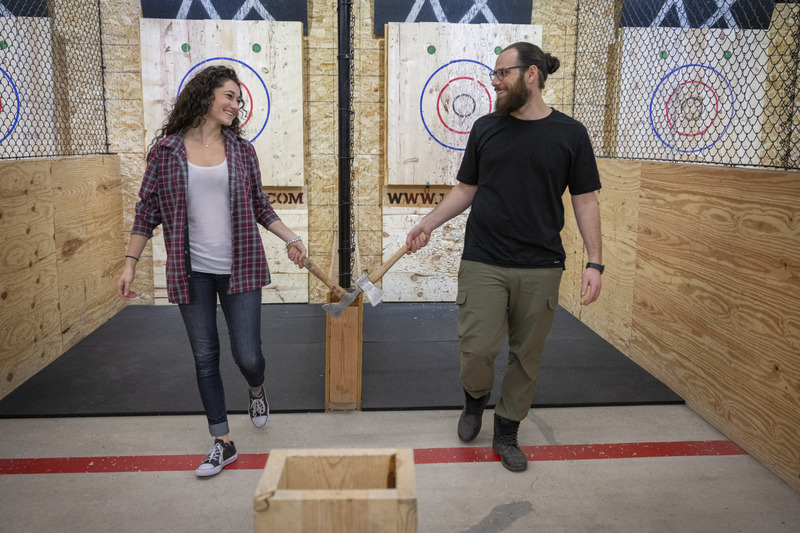 BURY THE HATCHET As real-life couple Carly Chalom and Saul Hammerschlag demonstrate, at LA AX you and your sweetheart can channel your inner frontier spirit and try the sport that’s been hailed as the new bowling. Photo by Daniel Deitch. There’s nothing wrong with the classic dinner-and-a-movie date, but the start of a new year is a perfect opportunity to resolve to try something different. Whether you’re just getting to know your sweetheart or keeping the spark alive after many years as a couple, learning a fresh skill together or embarking on a shared adventure is a wonderful way to deepen your bond with that special someone. As Valentine’s Day approaches, now’s the ideal time to start getting creative when it comes to date night. Luckily, there are plenty of places nearby where couples can mix it up with more active — and interactive — pastimes. Consult our version of a honey-do list for creative ideas to make you and your partner feel like a truly dynamic duo! Closed-toe shoes are mandatory for participation. Flannels a la Bunyan are optional. “What couple doesn’t want to be a famous trapeze duo?” asks Rex Camphuis, co-founder and executive director of Cirque School in Los Angeles. HEAD OVER HEELS Run away together and join the circus — or at least learn some cool new tricks — at Cirque School. Photo courtesy of Cirque School. Dance is an age-old form of romance, and the tango is viewed by many as the holy grail of partner dancing, says Emma Bogren, instructor and a founder of LA Tango Academy in North Hollywood. “It’s a journey not only in dance and movement but in awareness of your body and your partner,” she says. That journey can begin at the academy’s Tango Boot Camp, a special, intensive four-hour introduction to the dance, February 15 and 16. The academy, which teaches social Argentine tango, also offers regularly scheduled classes. TWO TO TANGO Experience the most romantic form of partner dancing at LA Tango Academy. Photo courtesy of LA Tango Academy. CULINARY COURTSHIP Learning to prepare a meal together at COOK LA is the romantic gift that keeps on giving. Photo courtesy of COOK LA. Another recipe for romance is to take your partner on a culinary adventure. A cooking class is “great for couples to interact on a first date or for longtime couples looking to try something different than an ordinary restaurant outing,” says Liz Alexanian, owner and chef instructor at COOK LA in Studio City. The school offers assorted classes “from preparing worldwide cuisines to basic cooking techniques — and teaches you how to cook foods that heal our bodies, all in a fun, engaging atmosphere designed for all cooking types,” she says — so no worries if your slicing and dicing skills are nonexistent. What better way to get in tune with your heartbeat than grooving to the beat of a drum? “Feel the love one drum beat at a time!” proclaims Christopher Ramirez, owner of Freedom Drum Circles. Sessions such as social drumming experiences allow couples to meet other rhythm enthusiasts and to get to know their partner “by opening hearts and minds to new sensations of spontaneity and self-discovery through rhythm,” says Ramirez, who’s also director of Burbank Drum Circles Remo RMC, where the sessions are held. Couples group drumming is also offered and is “good for the mind, body and soul. The rhythm enhances a better understanding of trust, deeper listening with a sense of joy shared in the moment,” Ramirez says. Participants need no experience or drums. You might not expect a typical date to involve punching and kicking, but “training together as a couple in self-defense has so many positive effects on a relationship,” says Donnie Jeffcoat, owner and chief instructor of Shaolin American Self-Defense Academy in North Hollywood. Self-defense keeps both partners physically fit and encourages a healthy mind and spirit. “The journey to black belt forges a resilient and deep bond between partners,” he says. Plus, he points out, it’s comforting to know that your partner is capable of protecting themselves. LOVING PRESENCE De-stress and practice mindfulness with your partner at Shosha Yoga. Photo by Daniel Deitch. Want to make beautiful music together? Learn to play the guitar as a couple. “Guitar lessons for couples is a great way to learn because you can encourage each other in practice and achieve goals and, of course, duet together,” says Shawn Staples of Shawn Staples Guitar Lessons. 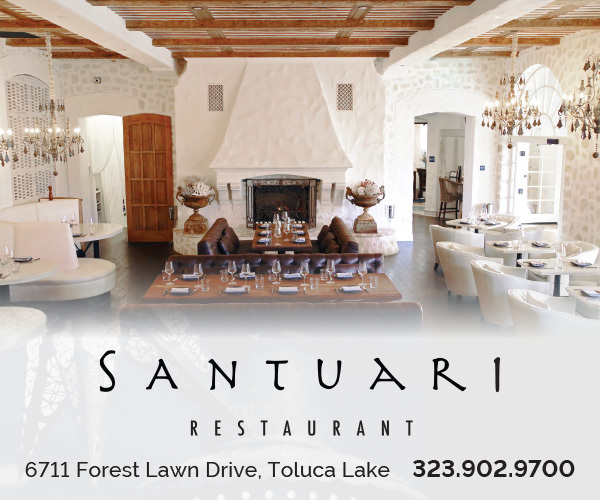 The Toluca Lake resident teaches his students in their homes and offers free first lessons for Toluca Lake Magazine readers. Bring a bit of swashbuckling to your relationship by donning a mask and engaging in swordplay with your partner. “It will keep you together longer,” says Tim Weske, owner of Swordplay LA in Burbank. “There’s no better way to get rid of frustration in a relationship than to whack each other with a piece of steel,” he jokes — “in a very safe environment, of course.” Swordplay LA offers lessons on three types of weapons — foil, sabre and epee. “The exercise makes you sweat and makes you smile, and both of those things are great for couples to share,” Weske says. 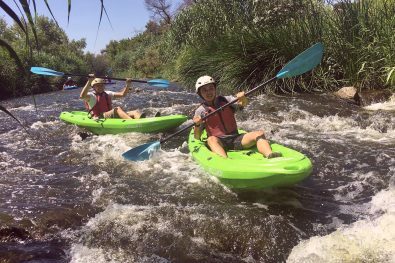 PADDLE POWER Couples can get close to nature in the middle of the city while traversing the Los Angeles River. Photo courtesy of Steve Appleton.